"This is so easy, so good, and so versatile! I've used pork chops with and without bones, pork loin, and pork roast. You can sprinkle the brown sugar, salt, and pepper on the different layers or all at the end, as mentioned in the recipe. Play around with the brown sugar and spices to your taste." 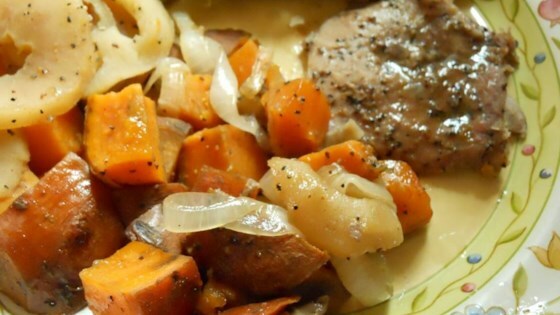 Cover, and bake 1 hour in the preheated oven, until sweet potatoes are tender and pork chops have reached an internal temperature of 145 degrees F (63 degrees C). I'm sorry, but the pepper on this awful. It was so hot, we ended up eating cereal for dinner. I think if you put MAYBE 1/4 of the amount called for, you would have an "OK" meal. We loved this recipe. It was a breeze to put together and was simply delicious. I did brown the chops before baking. I wouldn't change a thing about this recipe.